Berhanu Tekleyared and his two other compatriots were caught last March by Ethiopian regime operatives as they were trekking towards the country’s northern border to join Ginbot 7, an armed resistance movement; and which the rubber stamp parliament in Addis Ababa declared as a “terrorist” organization along with other organizations such as the OLF and ONLF . Berhanu and two others, a woman by the name Eyerusalem Tesfaw and Fikremariam Asmamaw were leading members of the Blue Party, a popular political party in Ethiopia with no luck of winning seats in parliament thru peaceful and legal means of struggle as the ruling Tigray People’s Liberation Front (TPLF) had rigged all the five elections held in the country in the last 25 years and made peaceful democratic change impossible by using all sorts of legal mechanisms and above all repressive measures against the peaceful and legal opposition in the country. The three, during trials at the kangaroo courts in Addis Ababa have refused lawyers and told the court upfront that they were members of Ginbot 7 and they have committed no crime. Tekleyared was even bolder when he told the court that he tried all peaceful means through his party to bring democratic changes in the country, and that the only option left for him was to join armed groups. He challenged the court that the “anti terrorism law” that he was told had violated, is itself against the constitution. Held in inhumane conditions, beaten and tortured, Tekleyard, the young political prisoner had, however, managed to slip a letter through the cracks of the highly guarded dungeon, exposing the torture and inhuman treatment of political prisoners and other prisoners of conscience. Although Tekleyared was no exception and did not escape the daily realities of beatings and harassment by Ethiopian prison officials; he chose not to talk about his own ordeal, but instead, wrote about the tribulations of his fellow prisoner. 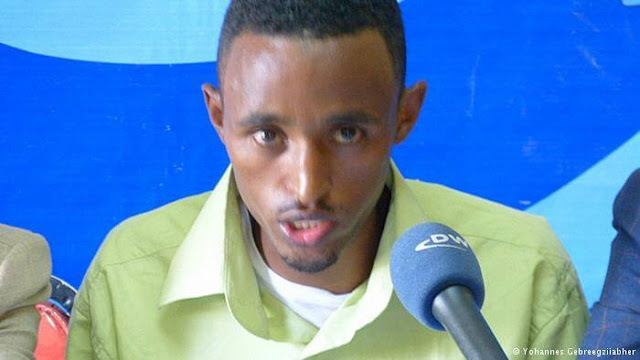 In a letter that’s widely circulating in the social media, after it was first released by ESAT, Tekleyared, who was head of organizational affairs for the Blue Party at the time of his abduction, gave horrific details about the treatment of a young prisoner, who is now his mate at the notorious Kilinto penitentiary. The young prisoner, whose name Tekleyared withheld for the obvious reasons, had confided him about the torture he endured, which was carried out by TPLF prison officers while he was at the infamous Central Police Station in Addis Ababa, seen by many as Ethiopia’s torture chamber. The young man was charged according to “the terrorism law,” a law cooked up by the TPLF regime to be used against dissenters, members of opposition political parties and journalists who dare to write the truth. Suffice to mention the case of the Zone 9 bloggers collective, journalists Eskinder Nega and Temesgen Desalegn. Eskinder and Temesgen are still in jail serving 18 and 3 years respectively, while the Zone 9 bloggers were released last month after a year and half in the notorious Kaliti prison. A court in Addis Ababa dropped all charges against the bloggers following an international uproar and criticism. Ethiopia has a long list of dissenters, politicians, journalists and ordinary citizens arrested and incarcerated with no proof whatsoever of “committing” what the brutal regime called “acts of terrorism”. Writing criticisms against the government, speaking one’s mind on issues of democracy and freedom, being a member of an opposition political party etc, etc, are good enough reasons for the brutal regime to level terrorism charges against law abiding citizens. The young prisoner, who hails from Gondar, told Tekleyared that the authorities first moved him around to the various secret houses in Addis Ababa and elsewhere before they took him to the Central Police Station. He was told by his tormentors that he was a “terrorist” and his charges were “terrorism.” At the secret houses and at the Central Police Station, he was mercilessly beaten by the TPLF prison bosses in a futile endeavor to make him confess the trumped up charges. The young man however refused to give false confessions to his tormentors. The regime is known for using confessions obtained under duress to convict people whom it deemed dissenters. In one of those days of agony, the prison officials, after ruthlessly beating him, forced him to take off his pants and pound him till he blacked out. He was told by one of the TPLF Tigrayan officers that they were beating him naked just to prove their point that the Amharas have “taken their pants off,” a reference in the Amharic language to mean that one “is not man enough to challenge anyone” and has “surrendered” to the powers that be. Insulting and taunting the Amaharas has been a common practice by the TPLF Tigrayan security and prison officials when they torture the Amharas whom the regime perceives (or wants other Tigrayans to believe) as enemies of Tigrayans. Here, a distinction between the TPLF Tigrayans and the people of Tigray is warranted, the overwhelming majority of whom are also victims of the ruthless TPLF that claim to represent them. The gang of criminals at the TPLF, who happen to hail from Tigray, control the government, security, the military, foreign affairs, and even the economy by far disproporunate to their number and an iron fist rule. It is worth to mention here that the Tigrayans represent only 4% of the over 90 million Ethiopian population. Tekleyared in his letter also called on leaders and the rank and file of the Amhara National Democratic Movement (ANDM), that claims to represent the Amharas but in reality which has aligned itself with the TPLF, to instead show their allegiance to the Amharas who are being persecuted by the TPLF Tigrayan regime. The ANDM, one of the four members of the coalition, the Ethiopian Peoples’ Revolutionary Democratic Front (EPRDF) is a puppet Party, which solely serves the interests of the TPLF Tigayans. He said the ANDM did nothing when thousands of Amahars were uprooted and displaced from Southern Ethiopia. He recalled that leaders of the ANDM had instead made a mockery of the misery of the displaced Amharas saying “no single Amhara was displaced from Southern Ethiopia.” It is a public knowledge that some of the leaders at the top of the ANDM are not Amharas but Tigrayans. Tekleyared brought to the attention of leaders and the rank and file at the ANDM the sacrifices made by Amharas who rallied behind ANDM and TPLF in their days as rebels fighting to topple the military regime in Ethiopia. He warned in the letter that those Amahara fighters did not give their lives in vain, but for the respect of the Amaharas and others as equal partners in a utopia of Ethiopia that they wished to create. He expressed his disgust that the ANDM, copycatting from the TPLF, is celebrating its 35th anniversary spending 300 million birr (roughly 15 million dollars) for a lavish party while 15million people, many of whom Amharas, need immediate food assistance; and at a time when children were dying as a result of the ongoing drought in Ethiopia. The torture story of the young prisoner and of Tekleyared is just one from the thousand others that has become the norm instead of the exception in the present day Ethiopia, the country held hostage by the TPLF Tigrayans.